When I read from the papers that 15 policemen specializing on football hooliganism were invited to help Estonian police over the days of the Estonia-England game, I imagined them to be some suits in an office, “consulting” the local officials. 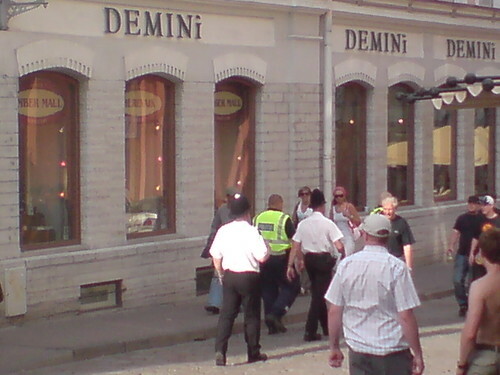 Actually there were the good old black helmets walking in the Old Town Tallinn, stopping by the English supporter groups at open air pubs and chatting with them. Probably they have a bit more experience on how to communicate with a bluecollar bloke from Sheffield after his 8th pint under the belt. Plus the visual effect of merging cultures. Quite a smart trick. The British go wild when they are let out, or they go in groups to the pubs or restaurants or anywhere – it is the culture!! They are like children again when they go abroad because there are not so many restrictions as there are on the island. God save the Queen! I live in Wales – do not like it there..Was in Latvia recently and found they all had good manners unlike the visitors from Wales.